The student will focus on one of the several yield QTLs identified in a D genome nested association mapping (DNAM) population (see table below). 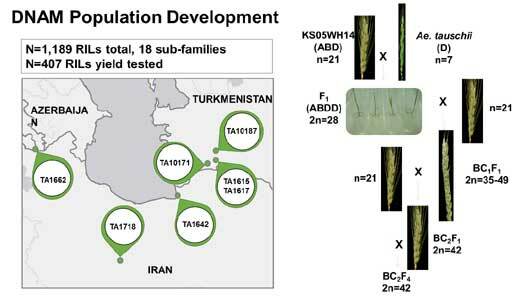 The DNAM population was produced from direct hybridization of seven Aegilops tauschii accessions with the hexaploid winter wheat genotype, KS05HW14 (figure below). Five, QTLs were identified from 10 year x locations yield trials (see Table below) in a collaborative project at MSU and SDSU. The student at SDSU will focus on yield QTL on chromosome 7DS that explains 3.3% of the variation, with Ae. tauschii allele (TA1615) contributing the positive allele.